Andrea Baracco and Vincenzo Manna’s adaptation of Julius Caesar has abruptly changed the mood set by the other companies who have taken part in the Globe to Globe season to date. 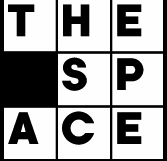 This Giulio Cesare, which opened to critical acclaim in Italy in June 2011, made no concessions to the unique performance space offered by the Globe stage and granted none of the light relief Globe audiences are used to, either through a direct interaction between the actors and the audience or through an emphasis on the comic elements that often underpin Shakespeare’s tragedies. Unlike the lively and energetic Richard III performed in Mandarin by the National Theatre of China, or even the Maori Troilus and Cressida, which injected energy and vitality into Shakespeare’s problematic and cynical play, Baracco and Manna’s Giulio Cesare offered the Globe audience a much more challenging, though hugely rewarding, experience. Skillfully performed by six young actors, the play was electrifying but also exhausting to watch, at least partly because it ushers the audience into a world that is already irredeemably marred by political corruption and moral and intellectual paralysis. The boldest directorial intervention in this pared down version of Julius Caesar is the excision of Caesar. Granted that the play is named after a character who speaks a mere 5% of the lines in Shakespeare’s play, the realization that Caesar was never going to materialize on stage came as a shock. And yet cutting Caesar does make sense, both in relation to the play, where, to misquote Hamlet, ‘nothing’, including the elusive character of Caesar, ‘is good or bad by telling makes it so’, and in relation to this production, where the killing of Caesar, the climax of the tragic action in Shakespeare’s play, was effectively executed. At this pivotal moment in the play, Bruto (Giandomenico Cupaiuolo), Cassio (Roberto Manzi) and Casca (Lucas Waldem Zanforlini) marched slowly downstage and proceeded to slash a bottomless chair, which featured prominently throughout the production as the seat of power that Caesar aspires to. It was unfortunate that some members of the audience, who do not speak Italian and were sitting or standing directly behind the two columns that support the roof above the stage, missed the killing of Caesar altogether and told me afterwards that they resented the omission of the one line they were listening out for – Et tu, Brute? The bottomless chair, in which Bruto and Cassio got suggestively and awkwardly stuck at different times before killing Caesar, is representative of this production’s emphasis on a few distinctive visual elements suggested by Shakespeare’s dialogue. 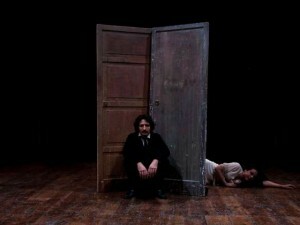 Central to Baracco’s and Manna’s re-interpretation of the play are, for example, three large doors, occasionally left to stand on an otherwise empty stage or more often supported by the actors, who used them both as an extension of the tiring house and as a liminal space behind which their characters cowered or skulked as the main action unfolded on the stage. The doors worked best when the actors used them as screens to suggest absent characters or even states of minds, as in the forum, when caps and flowers tied to long poles were held up from behind the doors to signify the throng of plebeians listening to Brutus’s and Cassius’s orations, or in Brutus’s house, on the night before the killing of Caesar, when one hand protruding from behind one door supported Brutus’s head, trying to lull him into sleep, and another hand clicked its fingers to wake him up every time he dozed off. Similarly memorable for me were the female characters, who have notoriously limited roles in a play that explores the impact of stifling and corrupt power structures on the lives of strong male individuals. This production gives Calpurnia (Ersilia Lombardo) and Porzia (Livia Castiglioni) more space and new lines. Calpurnia was visibly torn apart by her inability to give Cesare a child, a successor, and sought shelter from the public scrutiny and shaming she is exposed to during the Lupercalia by knocking on doors that did not only remain shut but also repulsed her, sending her crushing down, repeatedly, on the floor. Baracco and Manna added more action later in the play to show Porzia’s suicide, which is only reported in Shakespeare’s play. Blood-red stains on Porzia’s hands and face, as well as the violence inflicted on Calpurnia’s body, were stark reminders that the type of power so forcefully critiqued by Bruto and Cassio affects the public as well as the private lives not only of those who crave it but also, and tragically, of those who resist it. While some of the stage images may have remained impenetrable to members of the audience who do not speak Italian, the production made a lasting impression, and nothing, I think, more powerfully than the angular, broken bodies of the soldiers in Bruto’s army, who, wrapped up in trench coats with their faces covered, did not shrink from killing his leader when he asks them to at the end of the play. In fact, they stabbed him several times, thus giving the audience the climactic killing of another charismatic but flawed individual, who died admitting that ‘ho frainteso tutto’ (‘I got it all wrong’). Sonia is Reader in Shakespeare Studies at King's College London. She has published widely on global Shakespeare, including World-Wide Shakespeares (Routledge 2005) and, most recently, an article on Shakespeare in Italy, published in the Guardian as part of the series on 'Shakespeare is ...' (http://www.guardian.co.uk/stage/2012/apr/25/why-shakespeare-is-italian). Sonia is currently working on a book on Intercultural Shakespeare. wow, what a cool mini-shakespeare-story… I actually just meant in the more abstract sense that Caesar’s character is present in every scene by way of dialogue between other characters, as well as being a darker spiritual presence after he has been assassinated, that might in some way be guiding his murderers to their various grizzly ends. By axing Caesar the performance by an actor, it sounds as though they amplified the void left behind to the point of defeaning! Hi Paul! Thanks for your comment. The entire production was laden with symbolic stage images and stylized gestures, so the stabbing of the chair was entirely in keeping with the theatrical language and conventions chosen by director Andrea Baracco and co-writer Vincenzo Manna. I don’t think sympathy was the dominant response Baracco and Manna were trying to elicit from their audience. Baracco described Caesar during an interview at the Globe as a metaphorical locus or trope! So I think his aim is to get the audience (at least the audience in Italy) to reflect on the damage caused by a charismatic but flawed leader, and, more generally, by a type of power associated with unbridled individualism (embodied by Caesar, and simultaneously desired and resisted by the conspirators). I did wonder whether Caesar’s ghost would be included in this production, since Caesar was not! Caesar’s ghost was included and was played by Ersilia Lombardo (Calpurnia). Lombardo was sitting or crouching on a small cart, she was dressed in black from head to toe and held a candle with one hand and a knife with another. While delivering the ghost’s lines she repeatedly stubbed the candle holder. I think she then passed the candle to Brutus who blew it out … Clearly another highly symbolic moment in this stylized production! I had a chance to ask the director, Andrea Baracco, why he had chosen Lombardo to play the ghost and he said that Calpurnia seemed the best character because she is closest to Caesar in the fictive world of the play. Apologies for slow reply! I am at the Globe six days a week!! Caesar’s ghost… sounds spooky! Grazie! Many thanks, Sonia. The stabbing of a bottomless chair instead of Caesar sounds absurd. I suppose the production omitted the conspirators bathing their hands in Caesar’s blood, too? What, if anything, seemed terrible about what they’d done? How was Mark Antony able to inspire sympathy for the rebellion?